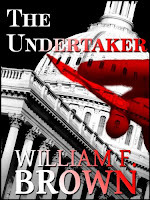 Ana Mardoll's Ramblings: Author Interview: William Brown on "The Undertaker"
Author Interview: William Brown on "The Undertaker"
Ana: Today we have William Brown introducing their novel, "The Undertaker". I haven't read this book myself, but William was kind enough to agree to guest blog about their book to any readers who might be interested in the subject. William, how would you describe your novel to your prospective readers? In broad terms, what is your novel about? William: "The Undertaker" is a fast-paced, contemporary, domestic thriller, a fun read, and I think a great beach book with a touch of romance, a dose of stark terror, and lot of humor. Pete Talbott is a Boston computer wonk still grieving over the death of his wife when he sees his own obituary in the morning newspaper. That’s a mystery he can’t leave well-enough alone. Someone with a sharp scalpel and an embalming table is planting bodies under other people’s names, and if Talbott doesn’t stop them, he and his quirky new girlfriend, Sandy Kasmarek, will be next on the Undertaker’s list. They end up on the run, and the story takes the reader from the cornfields of Ohio to the slums of Chicago, a bloody kitchen in a Back Bay townhouse, New York’s Washington Square, and the nation’s Capitol itself as Pete and Sandy are chased by corrupt County sheriffs, mafia hit men, the FBI, and an army of Chicago cops. Ana: He reads his own obituary? I like that hook. What themes does your novel explore and what do you hope the reader will take away from the experience? Is there a particular feeling or experience that you hope to evoke in the reader? Essentially, do you hope your novel will mean to a reader? William: The novel is told in the first person, which is the first time in six novels that I’ve tried that. I really liked doing that, because it puts the reader closer to the characters and their emotions. First person doesn’t work for all stories, but it let me do some fun things with this one. Beyond that, if there is a theme, it deals with the characters, which I really liked. Pete is a lonely guy defending his wife’s memory who finds an improbable new love in the form of a karate-kicking amateur photographer and art gallery assistant with a bad French accent who can hot wire cars. And I have a couple of really sinister bad guys. So far, all the reviewers agree that it seems to work. Ana: But can his love interest also make good French toast? That's a potential deal-breaker. What prompted you to write this novel and did you have a specific inspiration in mind? Were you influenced by a certain author or work that inspired you to add your voice to this genre? Besides the boatloads of money and rockstar fame, what motivated you to write this book? William: Believe me, nothing comes from pure inspiration. As for rockstar fame and fortune, my best advice to writers is don’t give up your day job. Most of my story ideas have come from a good one-liner or a good historic or dramatic situation. That, and great characters, are a must for a story to go anywhere. In terms of one-liners, "The Undertaker" is about a guy who sees his own obituary in the newspaper. Another story I’m working on begins as a guy is on a plane coming in to land at O’Hare. He looks out the window and sees a murder taking place on a rooftop as the plane passes overhead. From those starting points, I begin asking a lot of who, what, and why questions, and build characters around those answers. Like most people who keep writing, you write because you enjoy the creative process and challenges for their own sake, not because you expect to make much money at it – because you probably won’t. William: I have always read suspense fiction and I hope the first person narrative, humor and snarky dialogue of "The Undertaker" reminds readers in some tiny way of Robert B Parker’s Spencer books, Robert Crais’ Elvis Cole , and even John D. MacDonald’s Travis Magee , Stuart Wood’s Stone Barrington , Lee Child’s Reacher , and Harlan Coben’s Myron Bolitar books. My personal suspense writer All-Time Hall of Fame would include Michael Connelly, Daniel Silva, David Baldacci, Dennis Lehane, Martin Cruz Smith, and Ken Follett, but they write such marvelously multi-layered stories that I would be honored to even sharpen their pencils. Ana: Is this your first or only published work, or have you published other novels? If you have published other novels, how do they compare to this one? Do you have any more novels planned, either as a follow-up to this one, or as a completely different novel or genre? William: I am the author of six suspense novels, two of which were previously published by mainstream houses on paper. "Thursday at Noon " is my most successful. My editor was the legendary Joan Kahn and it was published by St. Martin’s Press in hardback, paper, and various foreign editions. It was reviewed in The New Yorker and many other places. My first novel, "The Allah Conspiracy " was published in hardback by Beaufort Books. I plan to bring both of those novels out in E-book format later this year. "The Undertaker" is my e-book experiment. In addition to those, I have two new suspense novels that are presently off with my agent, and one that I am about half-finished with. The two now out with publishers are period piece adventure stories, one dealing with political intrigue, espionage, and missing art and treasure at the end of WWII. The other deals with the shifting alliances and loyalties in the closing days of WWII as the US and the Russians go head to head trying to grab the top German rocket and jet airplane engineers. In addition to those, I have a new one I’m working on that is about half finished. I have also written four screenplays, which won or placed in a number of national contests, one of which was briefly optioned. Screenplays are largely a Hollywood insider game, but writing them teaches you dramatic pacing, character arcs, and tight dialogue, which is very useful for a novelist to understand. William: "The Undertaker" is an e-book, available under that title on the Amazon Kindle site, as well as Sony Reader, Barnes and Noble Nook, IBook, and Kobo. I expect to have at least two more books out on those sites by the end of this year. Please check my web site for updates on my writing and other things. It also has the direct links to the books for those interested. Ana: Thank you, William. I understand you have the first chapter of your novel available as an excerpt for interested readers? And is there anything else you wish to add for our readers? William: Actually, I have the first chapter of "The Undertaker", plus the first chapters of all of my other novels out on my site. I even put the working drafts of the 3 as yet unpublished novels out there, so people can take a look and let me know what they think. Other writers tell me that’s a lot of fun for them and their readers, so I thought I’d give it a try. The 1st chapters are at the “Preview!” tabs along the top of the web page. Other tabs have new reviews and interviews if anyone wants to keep up with what I’m doing. Thanks for letting your readers meet me, Ana.